If you’ve got a problem with Google autocomplete, we can fix it. We’ve been successful in 100% of the cases we’ve taken on. Call us at 503-890-6663 for a quote. Google Autocomplete is the name of the program that offers suggestions to us as we begin to enter a search query. Sometimes called “autofill,” this feature is helpful for many, but for others it is a nightmare. Typing your name into Google and seeing autocomplete suggestions like “arrest,” “dui,” “mugshot,” “jail” and other negative terms can create a big problem if you’re interviewing for jobs or trying to operate your own business. Luckily, these negative suggestions can be fixed. In most low volume cases we see, the negative words next to your name or business can be eliminated in about 4 months. Higher volume cases can take longer. For a quote and to discuss your specific situation confidentially, call 503-890-6663. Google autocomplete is the suggestions you see when you start typing a query in Google’s search box. (See image at top of screen or read this post for more information). How do the suggestions get there? Google reports that the suggestions reflect content on the web and search activity by users. How are the suggestions changed? How long does it take to change the suggestions? For low search volume cases, the average is about 2-4 months. Higher search volume cases can take longer. Why does it take so long for the fixes to occur? 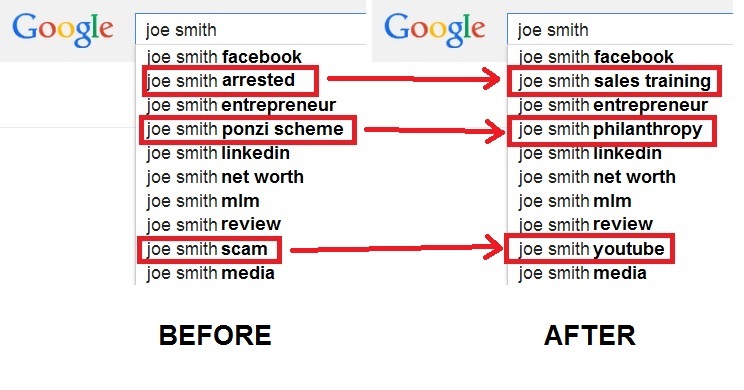 It takes a while for Google to recognize that new searches are being made. We have to be careful not to do too many searches at one time; otherwise we may trip a filter and the positive term may never appear. We are conservative in our approach and that’s one reason why we’ve been so successful. How important is content in the Autocomplete equation? It helps to have relevant content that includes the positive keywords we’re searching for. Having said that, it’s not 100% necessary that you have content that corresponds to your search queries. As of April 2014, we’ve appended dozens of keywords to client names where no relevant content exists. But we feel this is risky and in the long run, it’s always better to have content that’s relevant to your keywords. How important is location to Google Autocomplete? It’s becoming more important. Lately, we’re seeing different results in different cities more often than we did a year ago – even for clients with low search volume. Read more here. Is Autocomplete harder to change in a specific city? Yes. It’s harder because you’ve got to get the searches performed by people who live IN that city. Either that, or you’ve got to get an IP switching service to change your IP address to that city, We’ve managed cases where the client’s autofill results get fixed in every city except the one where they live or do business. Those results get fixed, too, once local search activity is high enough to force out the negative suggestions, but it takes a lot more work. How can an individual or company monitor their autocomplete results in different cities? It’s something you have to check by hand. You can change your location by following the instructions outlined here: http://changegoogleautocomplete.com/2013/11/29/location-matter-google-autocomplete/. No. I wish we could guarantee results, but we’re working at the behest of Google’s algorithm. Since we don’t control the algorithm or when it refreshes, we follow best practices for creating natural-looking search activity. We rely on our experience to get results for clients. Sometimes we are more successful than others depending on each specific case. Please call 503-890-6663 for more info and to ask about success rates. Once fixed, how long do the suggestions stick? This varies. As insurance, we always recommend a maintenance campaign because we’ve seen negative suggestions come back after a few months in about 50% of cases.